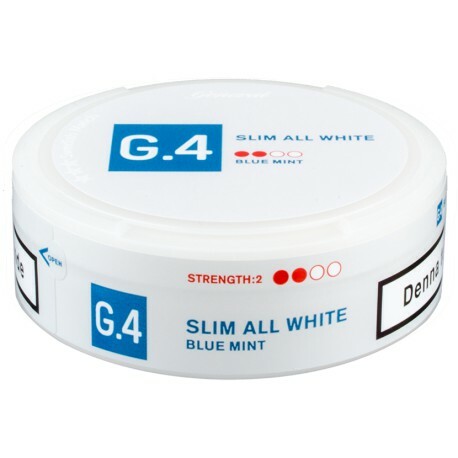 G.4 Blue Mint Slim All White Portion is an all white snus with no tobacco taste. The pouches are soft and deliver a long-lasting taste and nicotine experience. The snus has a light and spicy character with clear elements of peppermint and some spearmint and vanilla. The portion is slender and dry on the surface with moist content for low purity, slow release and a lasting taste. G.4 Blue Mint Slim All White Portion is the latest in the "all white snus" boom started by BAT/Winnington AB with Epok Snus. If you are a fan of Epok you MUST try the Swedish Match G.4 products. The difference will amaze you! Not a lot of mint but a very fresh and clean taste. A good go to Snus maybe just lacking a bit in how long the flavors last. This is the best tasting snus I have ever put in my mouth. Will absolutely be my every day snus from now on. G.4 Blue Mint is a great product with a satisfying peppermint/spearmint taste and a clean & cool mouth feel whilst delivering the right amount of nicotine for a regular strength snus user. I will be using this snus to compliment my daily driver snus, General Mint. I would rate it 5 stars if the flavor lasted a bit longer and had just a tiny bit more sweetness. I hope to see more regular strength G.4 products come out. I'm a regular epok snus user so when these came out I had to order some to try. Hopefully they will be just as good as epok or maybe even better. Can't wait until my order arrives tomorrow. 0 out of 15 people found this review useful.